Victoria stands beside her poster at TAS. The 2015 field season of the ASWT Project in Eagle Cave revealed interesting stratigraphy and preservation in the south trench profile. 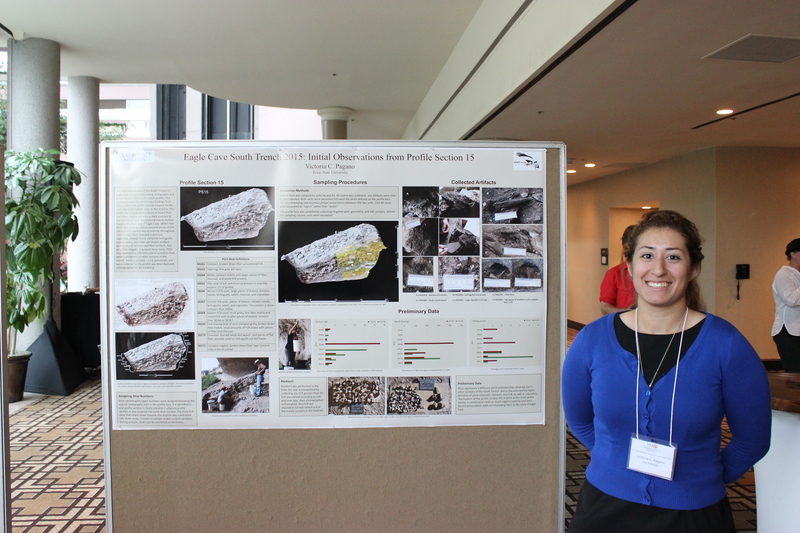 This poster presents the preliminary findings from PS15, a fiber-rich profile section located on the east side of the trench close to the dripline. The profile has unique preservation of mixed fiber and other organic remains, a stark contrast to the remains of later depositional events further towards the back wall of Eagle Cave. Within the PS15 fiber zone are dense concentrations of fire cracked rock layered almost entirely throughout. 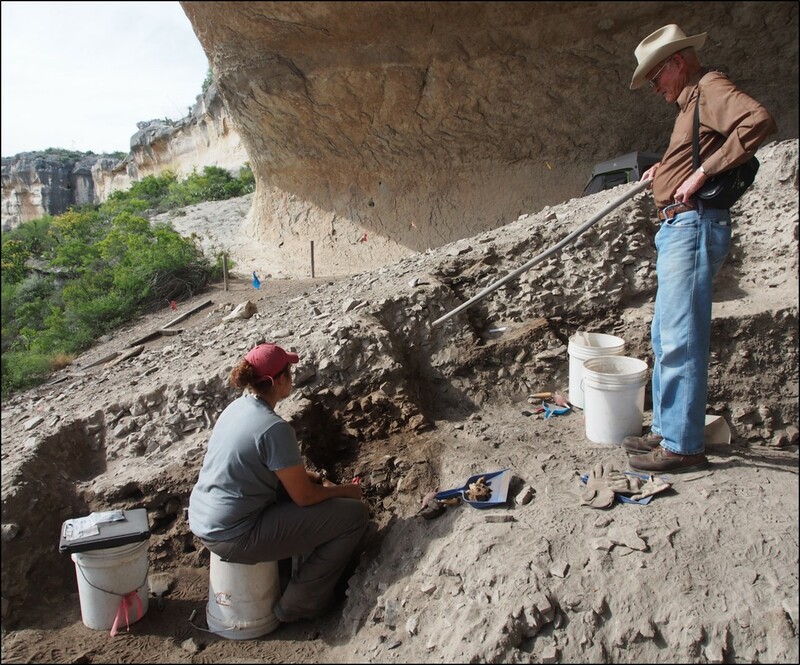 Interestingly, PS15 revealed numerous coprolites, several nearly complete lechuguilla central stems, and other perishable artifacts — such as faunal remains and fiber artifacts, but very little chipped or ground stone tools. 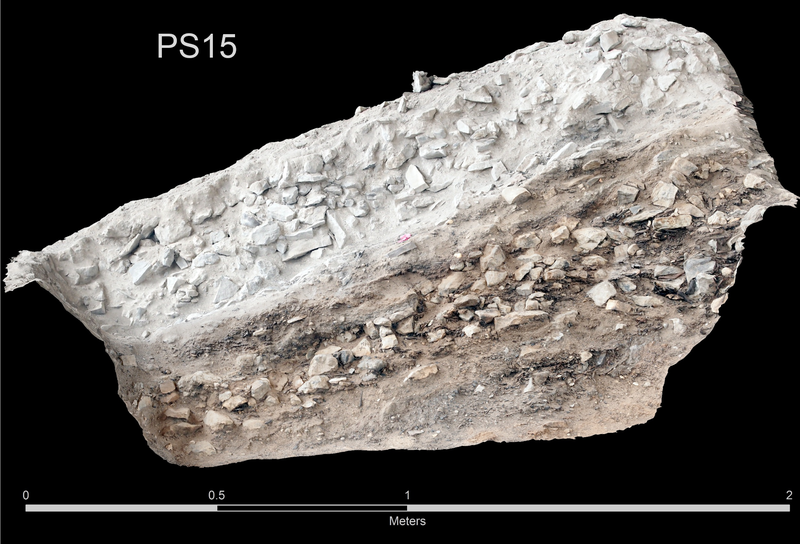 PS15 may represent a different suite of activities than what is preserved at other sections of the trench. Various samples — C14, geomorph, soil — were collected as the profile was described and photographed for 3D-modeling. Fully exposed, pre-sampling orthophoto of PS015. Strat (stratitraphic layer) numbers were assigned following the natural stratigraphy seen in the profile face. If a identified in one profile section is clearly present in adjacent profile section, it was assigned the same strat number. The thick FCR zone that slopes down towards the dripline was subdivided into three strats, in order to sample visible content variation. During analysis, strats can be combined as necessary. 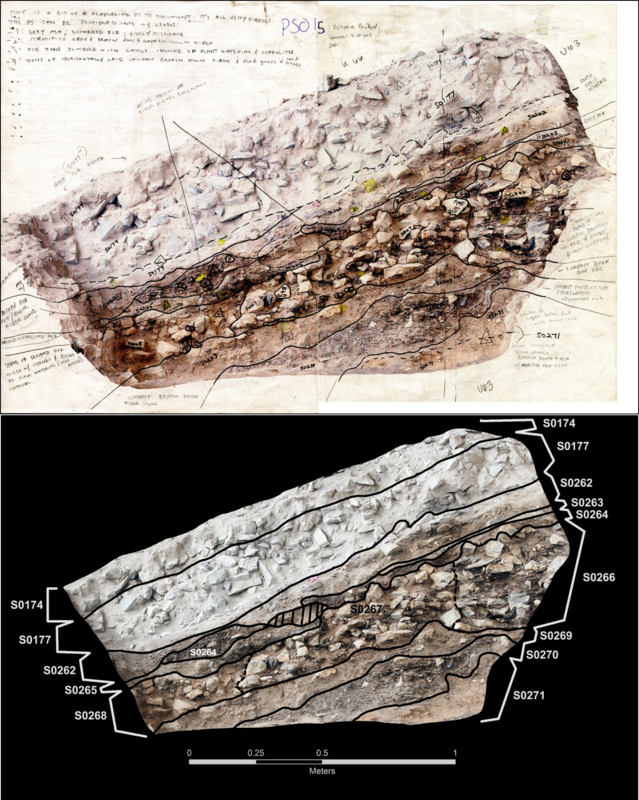 Field annotation (top) versus digital annotation (bottom) of PS015. 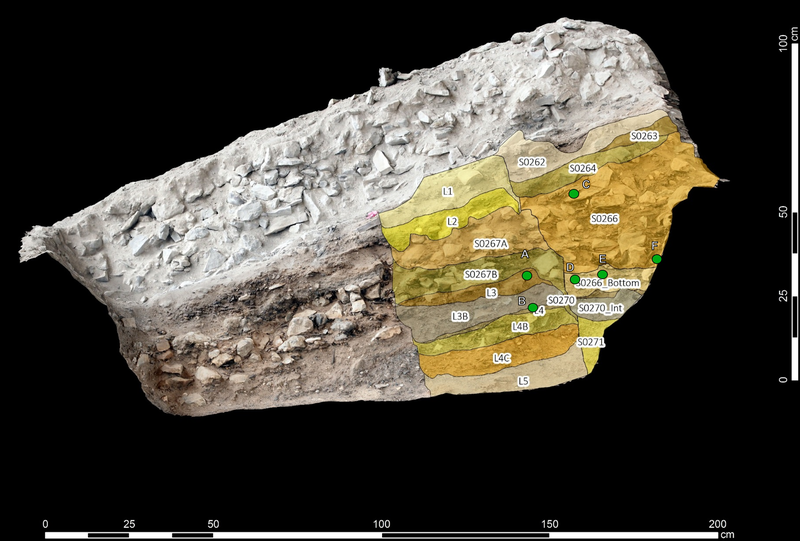 The field annotation has all the sample locations (geomatrix, C14, spot, and coprolites) plotted. S0262 Compact, broken down fiber w/scattered FCR. S0263 Tapering, thin gray ash layer. S0264 Mildly compact matrix with larger pieces of fiber, charcoal, and some FCR present. S0265 Thin strat of ash and charcoal present in only the eastern 1/3 of profile. S0266 Western FCR zone; large pieces of botanic remains (seeds, lecheguilla, sotol), charcoal, and coprolites. S0267 Central FCR zone; pieces of botanic remains (seeds, lechuguilla, sotol), and coprolites. This section is more compact than S0266. S0268 Eastern FCR zone; more gritty, fine fiber matrix and mixed FCR with smaller pieces of botanic remains than S0266 or S0267. S0269 East sloping strat of semi-compact gritty, broken down fiber matrix; small amounts of FCR mixed with pieces of fiber and charcoal. S0270 Charcoal–burned seeds and wood– and pieces of flat fiber, possibly sotol or lechuguilla cut leaf bases. S0271 Compact organic, broken down fiber layer present only in the SE corner. Victoria discussing PS015 with landowner Jack Skiles. The profile face was sampled by collecting targeted spot, geomatrix, and 14C samples, before the sampling column units were excavated. Orthophoto of sampled strats and collected artifacts interpolated onto PS15. The artifacts are shown below. A.) FN31874 – Remains of a sandal; B) FN32069 – Lechuguilla central stem; C.) FN31841 – Fiber knot; D.) FN31894 – Small, round cactus; E.) FN31861 – Large coprolite (115.16g): F) FN31860 – Two pieces of modified turtle carapace that re-fit. Rocksort was performed in the field, this was accomplished by collecting any FCR greater than 1in. FCR was sorted according to size and rock type, then photographed and weighed. Any FCR not separated out was sieved out of the matrix samples in the field lab. (Left) Total mass of FCR removed from each of the strats sampled in PS15. (Center) The amount of fiber and wood recovered from ½” sieve. (Right) Debitage count recovered from½” sieve. 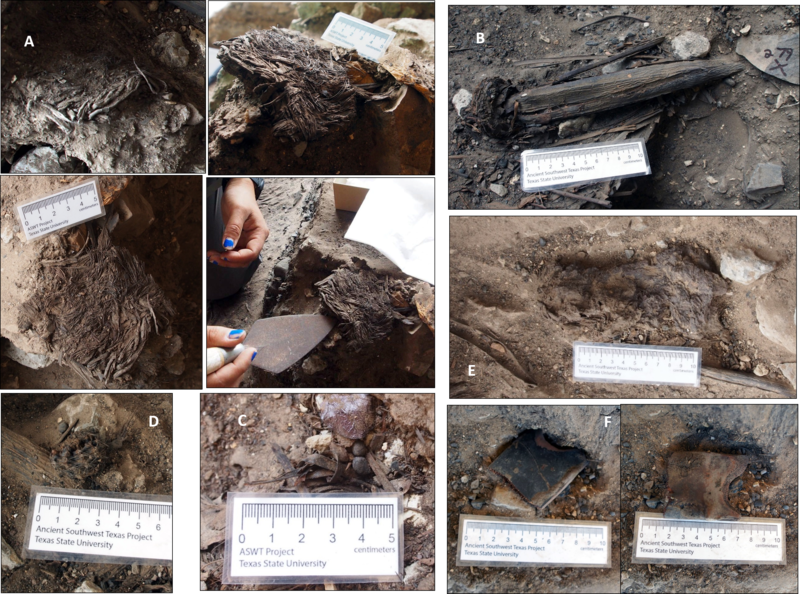 PS15 represents a different set of activities than what we see in other sections of the South Trench, and is characterized by higher densities of plant materials, charcoal, and FCR, as well as coprolites. The location of the profile so near the dripline at the front of the shelter in combination with so much organic material and semi-decent preservation, adds an interesting twist to the story of Eagle Cave.